Rescue Dawn is an unlikely adaptation: Werner Herzog has made a feature film based on one of his own documentaries. Viewers may forgive him this unusual act of recycling insofar as his documentary films are already widely known for blurring the boundaries between facts and fiction. ‘It’s all just movies’, he has famously declared. Both films concern Dieter Dengler, a German-born US pilot who was shot down in the early stages of the Vietnam War and held prisoner in a POW camp in Laos until he made a daring escape. Dengler tells the story in his own words in the memoir Escape from Laos, and Herzog, charmed by Dengler, subsequently filmed the documentary Little Dieter Needs to Fly. What comes across most profoundly in that earlier film is Herzog’s affection for his subject. Dengler has a fascinating way of narrating events and is clearly motivated by an attempt to make the most of life’s difficult circumstances. This admiration also comes across in Rescue Dawn, which Herzog wrote and directed. Even in the POW camp, Dengler, played here by Christian Bale, finds ways to make a feast from a plateful of maggots and encourages his fellow prisoners’ fantasies about the foods they once loved to eat. As he appears in both films, Dengler not only needed to fly, but needed to flee as well. It’s difficult to imagine a camp that could have contained him. Bale cleverly underplays the part, diminishing the real Dieter’s quirks and Germanic speech patterns. It is an astonishingly restrained performance, which is all the more unexpected given the fact that this is a film made by a director who descended several times into jungles with Klaus Kinski. Jeremy Davies, on the other hand, goes a bit Kinski. Davies has always acted with his whole body (in films from Solaris to Spanking the Monkey). Here too, the actor’s emaciated torso is used to uniquely expressive effect. Gene DeBruin, the prisoner played by Davies, is presented as a reluctant participant in his own escape and is curiously antagonistic to the group’s aspirations to freedom. His real-life family has objected to Herzog’s account, and the director may indeed have taken liberties, but Davies’ character – as it is written and performed – cuts a powerful counterpart to Bale’s Dengler. 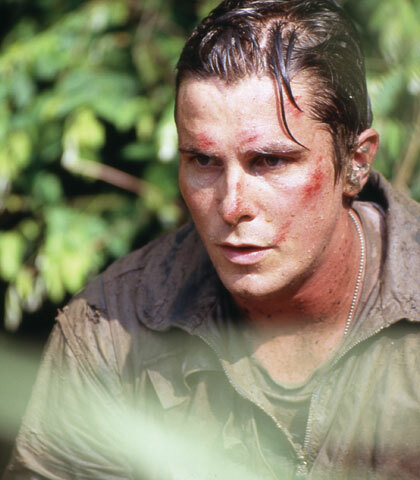 It may not have been necessary to have Bale eat maggots (as has been claimed) in order to achieve authenticity, but Herzog likes to film in tough circumstances so real stress and strain will pour through his performers’ faces and past the edges of the cinematic frame. He wants us to feel that we can, as he says, ‘believe our eyes again’. There are places in the film where less realism but more reality may have been called for. The Allied air war against Germany inspired Dengler to become a pilot, so it is more curious that he wanted to become a US pilot. Though this is discussed in Little Dieter Needs to Fly, Herzog makes only slight mention of the point in Rescue Dawn. The film takes place during the Vietnam War, and not before or after. The images of the Asian jungle are lush, though they hardly reach the expressive heights of Aguirre, Wrath of God. The narrative too is a bit tidier than some of Herzog’s fans may expect. While the director had a love-hate relationship with Kinski, his feelings for Dengler are less ambiguous, which may account for the somewhat surprising straightforwardness of the film’s ending. The Cinema of Werner Herzog: Aesthetic Ecstasy and Truth by Brad Prager is published by Wallflower Press.